Making your food into spirals just makes it that more FUN and enjoyable to eat! I hope you will swoon over the swoodles like I am! The spiralizer is a beautiful thing. If you have not purchased one yet, I highly recommend doing so! They are fun to use in the kitchen and can help increase your vegetable consumption by replacing something typically higher in carbohydrates with a veggie! I usually use my spiralizer to make zoodles **zucchini noodles** but today I opted for sweet potato (mainly because I had so many to use up!) I used the KitchenAid spiralizer attachment and it works SO well. There is seriously so much flavor in this one dish – it is delicious. I did not think sesame oil + soy sauce flavors would mesh well with sweet potato but my taste buds were happy! I would recommend making some type of Asian chicken to pair with this or even Asian flavored meatballs. Mmmm. Cook the sweet potato a 425F for 10-15 minutes (will not be fully cooked at this point). While the potato cools off a little, make the dressing! In a small bowl whisk together the liquid aminos/soy sauce, mirin, sesame oil, vinegar, honey, red pepper flakes, and salt. In a medium sauté pan heat the noodles with avocado oil for about 5 minutes (I like them slightly crunchy but cook longer, 10-15 min, if desired). Store in an airtight container in the fridge for up 5 days. Note: if you don't have Mirin, rice vinegar with a little sugar will do the trick! Or, opt out of the sugar since these noodles are already sweet with the honey and ACV. *Liquid aminos is a soy sauce alternative. 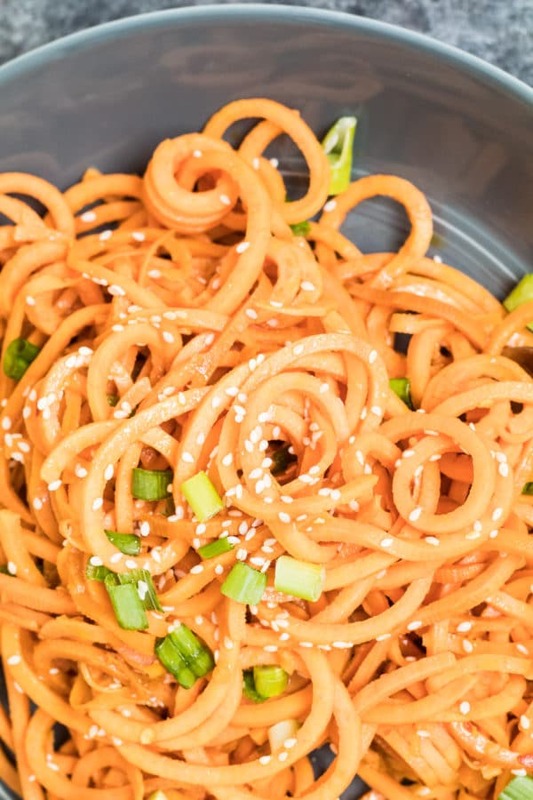 I love making sweet potato noodles! It was my first time ! So yummy ! 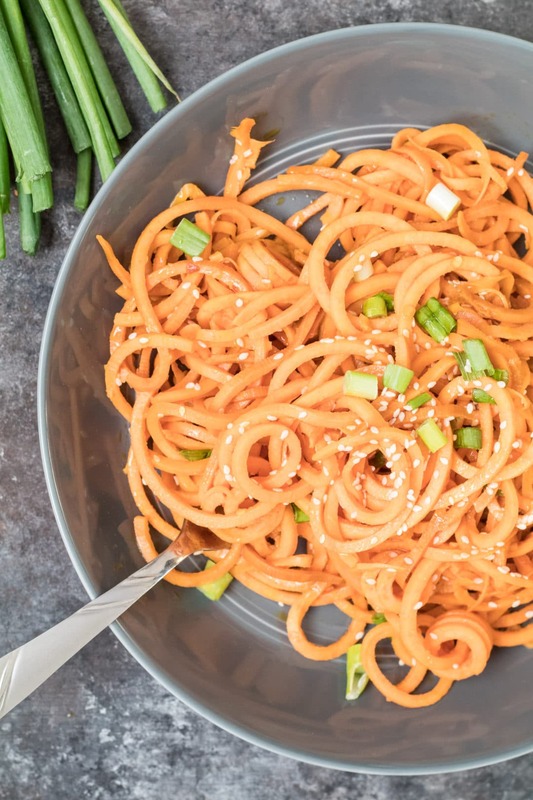 Of all of the vegetables I have spiralized sweet potatoes are my favorite! I like how they don’t release a ton of water once cooked- this can dilute a sauce 🙂 These look so yummy!